"you want to notify multiple controls about an client side event." When value inside some control of a grid changes , sum and average needs to be calculated and displayed. 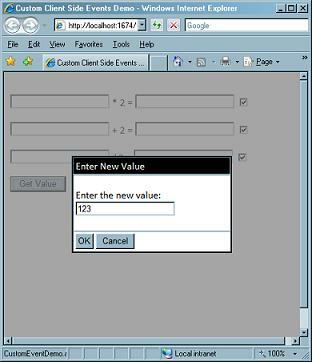 You may want to perform validation and few calculation on 'click' event of an ASP.NET 'button' control. What are 'Client-Side Custom events' ? In first row results of the operation : value * 2 is displayed. In first row results of the operation : value + 2 is displayed. In first row results of the operation : value / 2 is displayed. Screenshot of the sample application. Doesn't look like a big deal ! So why use custom events, when it is lot easier to write a single function to do all this, and hook it up to 'OnOkScript' property of the ModalPopupExtender. We could do that , but what if , we had 20 such operation ? wont a single function be too long and complex ? And what if we wanted the ability to add/remove handlers dynamically? In the above screen , I have placed checkboxes to facilitate dynamic attaching /detaching of handlers. Here , 'txtVal' is id of a texbox inside the modal popup where user enters a value. As a best practice, I should have tried to fetch 'ClientId' (since its a severside control) and use it, but since we are not dealing with repeaters and usercontrols , I am using the id directly (also because I am bit lazy). So when 'OK' button is clicked , the above function gets called and the 'okbuttonpressed' custom event gets triggered.